The Chronicles of Nairnia is a series of interviews by Christine Nairn, midfielder for the Orlando Pride of the National Women’s Soccer League (NWSL). Join Nairn as she interviews and gets to know the players fans may not know a lot about. Follow along as she meets new players, tells a little of their stories, acquires life advice, and learns about players’ paths to and within the NWSL. Editor’s note — This interview has been edited for clarity. My next guest describes herself as loyal, hard-working, inclusive, stubborn, and lighthearted — a complementary mosaic. 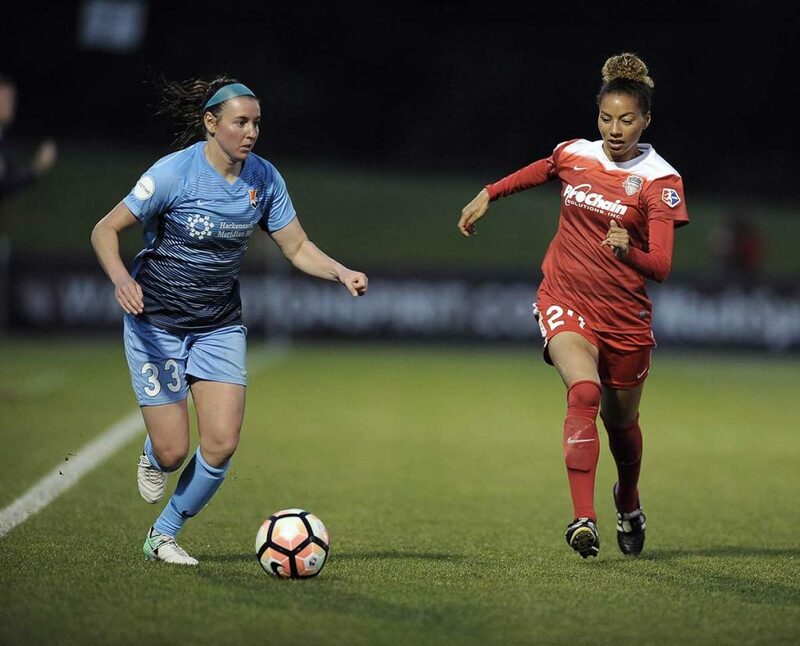 By constantly reminding herself that life doesn’t have to be so serious, this Washington Spirit defender and newly signed model is learning how to fall back in love with the game of football. Christine Nairn: What book are most likely to recommend to others & why? Estelle Johnson: I would go with The Subtle Art of not Giving a F*ck by Mark Manson. The book resonated with me and my everyday life and as an athlete. As professional athletes, I feel that we’re always under so much pressure to perform and to succeed. At some point you have to find an outlet and this book puts a lot of things into perspective. Nairn: After reading The Subtle Art of not Giving a F*ck, what resonated with you, what things were put into perspective? Johnson: The basis of the book is to care about the things that matter and disregard the things that don’t. So the book helped me to put in perspective that yes, we are expected to succeed, we are expected to make that pass, we are expected to make that shot. But if we don’t, that doesn’t take away from the people that we are. I feel that too many athletes base their worth off of their performance and to me, that’s a dangerous game. If my self-worth was based off of my athletic performance, I would be a hot mess! Of course I want to be the best and win every time I step on the field but that’s just not going to happen. But I have to remind myself that losing doesn’t make me a loser. Nairn: What topic would you speak about it you were asked to give a TED Talk on something outside of your main area of expertise? Johnson: I would speak about confidence and how we can better instill it into the youth in my TED Talk. When I am not training with the Washington Spirit, I enjoy coaching both individuals and small groups. One of the common themes I see in today’s youth is their lack of self-confidence. We need to find a way to give them the tools to reach the joyful confidence that we had growing up. Whether that is through sport or another avenue, I would love to help instill confidence in young children around the world. Nairn: Looking at your Instagram (@EstelleJohnson24), you have recently gotten into modeling. Go on girl! Besides clearly being a fashionista, how did you start modeling? Johnson: I went through a stage at eight years old where I wanted to be a model. It only lasted a few years because I was distracted by sports; however, this past October I was asked to walk in a runway show for a charity, Becky’s Fund. When this moment presented itself, I knew I had to do it! At this show, I met a ton of people in the fashion scene and from there I have gotten opportunities to model. I was featured in Modern Luxury DC, invited to New York for Fashion Week, and have a shoot for Under Armour coming up! Needless to say, little Estelle has a big ol’ smile on her face at the moment. I hope to continue doing more in the future! Nairn: When you think of the word successful, who do you think of and why? Johnson: When I think of success, I think of Christie Pearce. I fangirled over her every time we played against her because she’s an all-around bad*ss. First and foremost, she was the cornerstone of the USA defense for years. While still a mainstay in the U.S. Women’s National Team, she had children and continued to be one of the fittest players on her team. I think she exemplifies what an everyday superwoman would be like. Nairn: With this being your eighth year as a professional, what is the best advice you could give an NWSL rookie and/or future NWSL star? Johnson: My advice is to play your role. Every player who comes into the league wants to be the superstar, new kid on the block; however, most times teams need the rookies to be role players rather than huge impact players. My advice applies to both a 90-minute player or if you are coming off the bench: Play your role to the best of your ability every day. Nairn: You stepped away from soccer in 2014. How did you decide it was time for that next step in your life? In 2015, you re-signed with the Washington Spirit. Talk us through that process. Johnson: During my each of my offseasons, I was working toward completing my MBA. In 2014, I had one trimester left and thought the stars were aligning for me to give up my boots and get a full-time job outside of athletics. After eight months of working a “normal job,” I realized that I was bored out of my mind. Granted, banking was not the best fit for me. In the back of my mind, I always knew that if the opportunity to play again arose, I wanted to play. I think I needed this year to reset my mind and fall back in love with the game. Fun Fact: In her first year back, Estelle played in all but one game for the Washington Spirit and logged 1,685 minutes throughout the year. Nairn: As female professional athletes, we always have to be one step ahead of the game and plan ahead — you never know with injuries, league stability, et cetera. What is next for you after soccer? Johnson: This is the question of the century! The answer at this point is I don’t know. I have a lot of ideas about things that I think I would be good at and things that I think I would enjoy. Most of these ideas revolve around starting my own business but you’ll have to wait and see! Nairn: As NWSL players, we have this strange addiction with soccer. At times we’re on cloud nine after a win while at other times we struggle physically, mentally, and financially. What is one struggle that has molded you into the player/person you are today? it usually takes from 3-4 different players for a goal to be scored. Once I realized that every single touch on the ball was not life or death, I was able to relax and just enjoy the game. I learned to care about the things that matter and not every single little missed pass or imperfect touch. Nairn: After all is said and done, how do you measure success? I accomplish most (if not all) of my goals. I can financially support myself and my family. I have the means and the lifestyle to travel the world (one of my biggest passions). As always, the secret to life is actively seeking your happiness. Find out what makes you tick and what wakes you up in the morning. At Finding Euphoria, our goal is to encourage individuals to pursue their goals, dreams, and happiness every day. We all struggle with problems, at every stage in life, but what defines us is how we react to those problems. Stop finding reasons and excuses why something will not work and go find your euphoria, whatever it may be! Christine Nairn is a midfielder for the Orlando Pride in the NWSL. She received a Bachelor of Arts degree in communications from Penn State University. Outside of soccer, Nairn owns Finding Euphoria (https://findingeuphoriathreads.com/), a clothing line devoted to encouraging everyone to prioritize happiness. You can follow her own journey on her blog at https://www.findingmyeuphoria.com/. Follow Euphoria Threads on Twitter and Instagram at @FindingEuphoriaThreads, and Nairn at @NairnChristine.